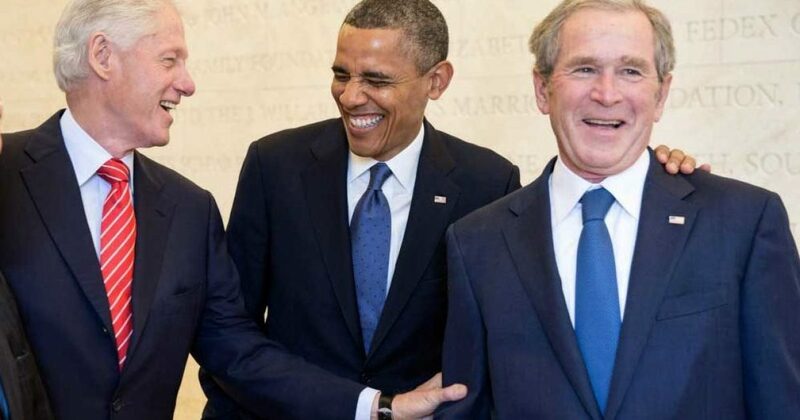 Ex-presidents are raking in over a million dollars a year each from taxpayers, just in pension and office expenses. This GOP Senator wants it STOPPED! Inspired by President Harry Truman’s difficulty to earn a living when he left the White House, the Former Presidents Act of 1958 provided ex-presidents with financial benefits after their terms were complete. Modern presidents have no such problem. Most leave the White House wealthy men, many having attained great wealth before entering office, living in the lap of luxury for the rest of their lives. George W. Bush, for example, sold his share of the Texas Rangers Major League baseball team for a profit of $15 million dollars two years before being elected President. That was the profit from only one investment. God only knows what Barack Hussein is worth. There were so many shell games with treasury assets during his tenure it would likely take an audit of several years to account for it all. As for the Clintons, do they really need huge sums of money from Mom and Pop America to make their mortgage payment? Billions of shady dollars went through the Clinton foundation for what was reported as disaster relief. The government of Haiti received only 2% of the six billion dollars that went through the Clinton Foundation that was marked for earthquake assistance. Where did the rest go? I think we all know the answer to that. The bottom line is modern presidents are doing just fine. The Former Presidents Act can now go the way of the dinosaur. Book deals and huge speaking fees alone amount to millions of dollars a year in income for ex-presidents. They are no longer serving us, they are servicing us. A Republican senator introduced legislation Tuesday to cut down on the amount of money ex-presidents siphon from taxpayers, looking to limit their pensions and office expenses. Sen. Joni Ernst, Iowa Republican, said that while presidents should keep getting taxpayer-funded security details, they don’t need the more than $1 million in pensions and office equipment that former Presidents Obama and George W. Bush are each expected to cost in 2018. Her bill would cap the annual pension payment at $200,000 per president, and would impose a cap on how much an ex-president’s office can cost. Initially the cap would be $500,000 a year, dropping over a decade to $250,000 per presidential office. “The reality is that post-presidential life already provides fruitful opportunities on its own, with former presidents raking in tens of millions of dollars from book deals, speaking engagements, and more,” Ms. Ernst said. The Washington Times reported last month that Mr. Obama is poised to become the most expensive ex-president during his first full year out of office, in 2018. Between his $236,000 pension, his $536,000 office rent in Washington, D.C., and other expenses, Mr. Obama will cost taxpayers some $1,153,000, according to the Congressional Research Service. His immediate predecessor, Mr. Bush, will get a $225,000 pension payment next year and his office in Dallas will cost $497,000, plus a higher communications and printing budget — bringing his total cost to just more than $1 million, the CRS said. Of the five ex-presidents alive, only former President Carter is slated to get less than $500,000 in taxpayer money next year. Since he only served four years, he doesn’t qualify for a pension, and his office expenses are far lower than the others. Ms. Ernst said nothing in her legislation would curtail the lifetime security provided for ex-presidents.